I hike. I camp. I do it alone. You can too. 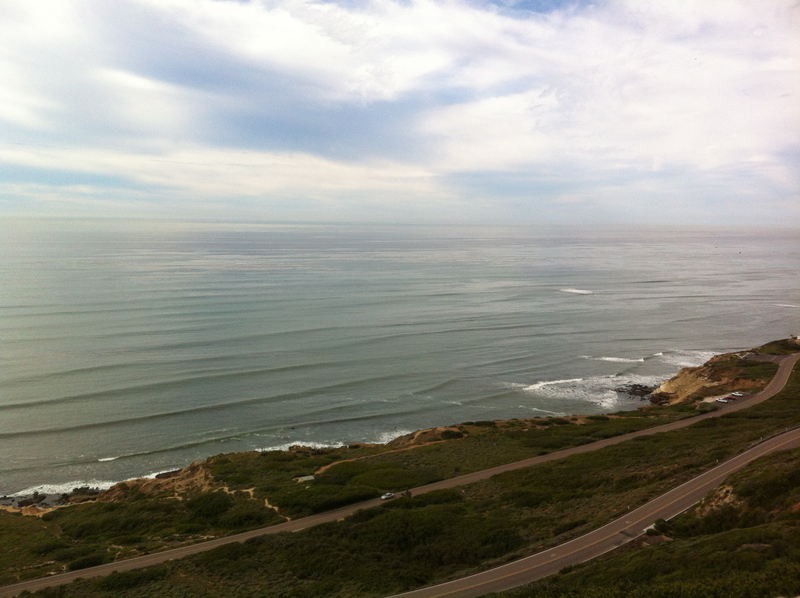 On Tuesday, I told you about a walk I took on a short hiking trail at Torrey Pines State Reserve. One of the reasons I kept that visit brief was because I had other plans: I wanted to get out to the Cabrillo National Monument as well. 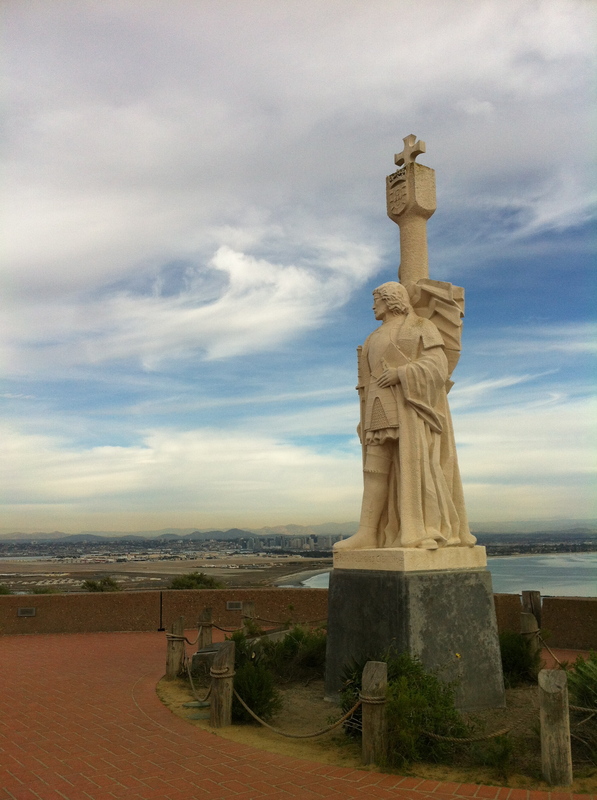 Statue of Juan Rodriguez Cabrillo. I have a thing about National Parks. in 2004, when I was driving cross country, I made the decision to make hiking and camping in National Parks the theme of the trip. This was partly because it was an inexpensive theme. Camping = cheaper than hotels, and a National Parks Pass was only $50 at the time, providing unlimited admission to the parks. But I fell in love. The sites themselves are amazing and well-maintained, the visitors centers are good, and the rangers and volunteers are enthusiastic and knowledgeable and informative. While on the trip, I bought a walking stick and proceeded to cover it with medallions from the National Parks I visited. This isn’t all of them — some didn’t have medallions, especially the smaller sites, but then a couple of years ago I discovered the National Parks Passport. I love collecting things, so this was awesome for me. I don’t have some Ahab quest to get stamps from all of the sites (there are 391-ish, depending on the source), but I do like to collect them anyhow. Back on topic. 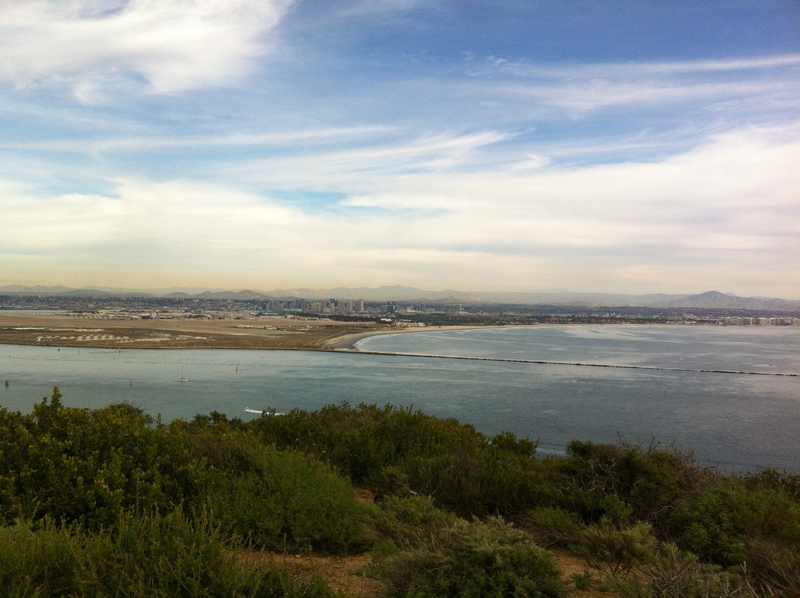 Cabrillo National Monument! The Monument, which was established in 1913 to commemorate the life and explorations of Juan Rodriguez Cabrillo, is at the tip of Point Loma, just past the naval base (so, a good place to see men in uniform as a bonus). Juan came to the Americas in the early 1500s, and in 1542, he set off from Mexico on an expedition on behalf of Spain to claim land and (surprise!) find a route to the Spice Islands. (Those explorers, so intent on getting spices.) On September 28, 1542, Juan and Company landed in a harbor he described as “a closed and very good port.” This very good port is now San Diego. Thus, the Monument in Juan’s honor. From the well-staffed visitor’s center — which has a gift shop/information desk, a museum, and a theater, as well as snacks and restrooms — walk up the path to the statue of Juan Rodriguez Cabrillo. You’ll be treated with a spectacular view of downtown San Diego on one side and the ocean on the other. 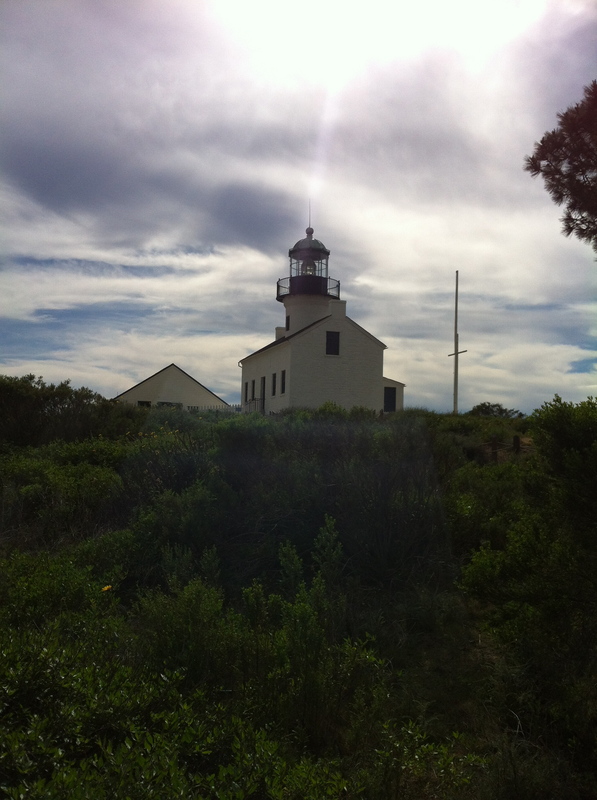 After that, walk up the hill towards the Point Loma Lighthouse. You can go inside and see rooms laid out as they would have been when a lighthouse keeper lived here with his (or her! they had female keepers here too) family. Continue past the lighthouse and up to the Whale Overlook, where, if you’re lucky, you can do some whale watching. I stood there a while and didn’t see anything, but I’ve also had so-so luck on whale-watching trips, so maybe it’s just me. Then you can loop back down and venture onto the Bayside Trail, which is a 2.5 mile walk descending 300 feet to the beach below. It’s a little steep, but not terrible. I walked on it a little ways, but decided not to do the whole loop because of time. If you’re looking for something a little different, there’s also an exhibit on old defense systems, and tidepools to visit. Cabrillo is a small site, but the rangers there are as enthusiastic and knowledgeable as anywhere, and you might see whales! It’s worth a visit if you have the time. Get Your Free National Parks Owner's Guide! Get Her Side in Your Inbox! © Lisa M. Palin, 2009-2012. Unauthorized use and/or duplication of this material, including photographs, without express and written permission from Lisa M. Palin is strictly prohibited. Excerpts and links may be used, provided that full and clear credit is given to Her Side of the Mountain with appropriate and specific direction to the original content. Unless otherwise noted, the author has not received any products reviewed herein for free. Darn it.